Beef, water, worcestershire sauce, soy sauce, teriyaki sauce, flavorings, crab boil, red pepper, liquid smoke, onion powder, crab boil liquid, hot sauce. The first thing I taste from the surface of these pieces is a salty seasoning flavor comprising of a multitude of spices. The chewing brings in the same but in more definition, very rich in spice blend, think of oregano, thyme, garlic, onion, basil, et al. There's also that faint bit of citrus I found in the Melange Original. I can also pick up a moderate level of heat. For being marketed as "Luziana Bonfire", specifically something spicy, it seems to hold up. 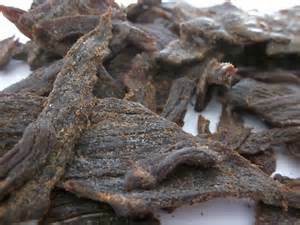 It definitely has a spicy kick both in terms of heat as well as spice variety. It's quite complex in spicy flavors but it also warms up the blood a little, indicative of chile peppers. But it doesn't really come across as being too hot. In fact, it seems to have a similar heat level as the Melange Original, perhaps at a "Medium" level (level 3 out of 5) on my personal heat scale. Where this Luziana Bonfire variety differs from the Melange Original, it's that it has more of the hot sauce flavor. 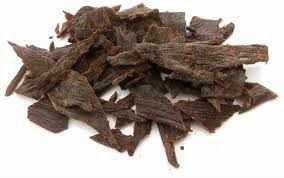 Otherwise, that flavors that seem to define this jerky starts primarily with the complex seasoning blend. It packs a punch of spice flavors along with the red pepper and heat that it could only be described as "cajun". The saucy blend of worcestershire, soy sauce, and teriyaki presents itself as a nice saucy base. There's also that subtle bit of citrus, a little bit of a tangy chew, and light touches of sweet to round out the flavors. The ingredients coalesce very well to create an addicting flavor that livens up the senses, gets the heart pumping, makes you reach for more. 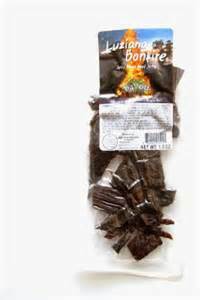 This Luziana Bonfire beef jerky from Bayou Blend has a very bold, complex seasoning flavor much like with the company's Melange Original. But it goes on to add even more of the hot sauce and red pepper flavor, making this more tangy, but also giving you more of an endorphin rush from the chile pepper. It's like a jerky that knocks out the classic cajun experience you tend to expect when you buy something labeled, "Bayou". I still wasn't able to get much of the natural meat flavors in this, but I felt the extra hot sauce and red pepper in this was enough to wake up the senses and get the heart pumping, for an exciting, enjoying snack. Thanks for the review. Just ordered this off Amazon for a pending camping trip. Are they still in business? Cant find it on Amazon, always unavailable.